The playground was made possible thanks to the generous support of the JACOB G. SCHMIDLAPP TRUSTS, Fifth Third Bank, Trustee. All of Ziegler Park's play areas encourage play, exercise, learning and social interaction while fostering the young imaginations of children from 2 to 12 years old. Nearly all playground features are entirely ADA accessible. 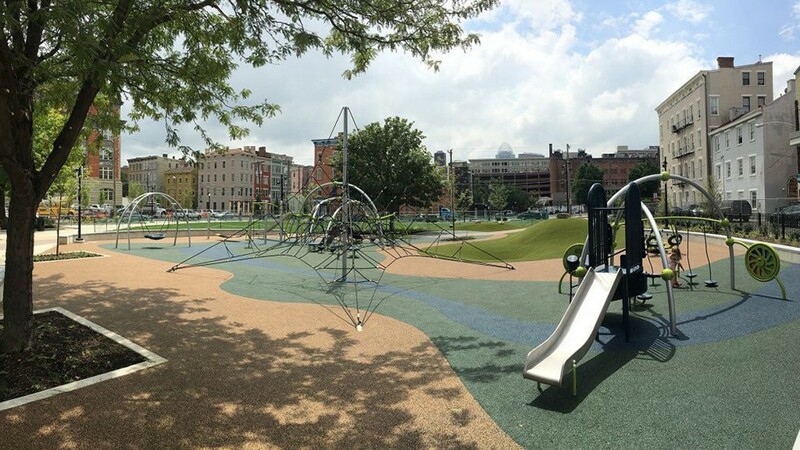 Located on the west side of the park, the playground area is connected to the sprayground by a play trail. Both areas are visible from a central plaza with plenty of shade and seating for parents and caregivers. Also at the central plaza, adults and children over 12 can enjoy additional activities like ping pong, chess and checkers. Highlighted by a number of unique features, the playground provides the neighborhood with an exciting and engaging play environment for children from 2 to 12 years old. In addition to being fun, the playground offers a wide variety of activities that encourage motor skills, develop sensory skills, promote social interaction and cooperation, build self-confidence, improve problem-solving ability and imagination, and increase general fitness. Interested in being a Play Ambassador? Click here to learn more.